This is the second blog from our 2018 Microgrant winners. 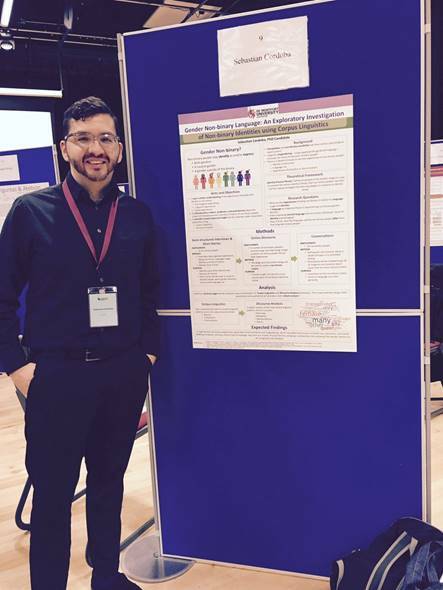 Sebastian Cordoba, PhD student at De Montfort University, was awarded £440 for research into understanding the psychological, linguistic and social experiences of people who don't identify as men or women in the UK. Read his story below. I am soon starting the third – and last – year of my PhD in social psychology at De Montfort University. My research focusses on the linguistic, social, and psychological experiences of those living in the UK who do not identify solely as men or women: non-binary and/or genderqueer people. I am particularly interested in the multiple ways non-binary people construct their gender identity linguistically. For instance, some non-binary people might adopt gender-neutral language for themselves: pronouns (e.g., they/them), labels (e.g., agender, bigender, gender-fluid, etc. ), titles (e.g., Mx), etc. By exploring these linguistic patterns and the ways in which non-binary people negotiate social interactions, my research aims to contribute to the knowledge base of non-binary gender identities. While non-binary gender identities have gained more cultural awareness and representation in mainstream culture, my research has revealed that there is indeed much to be learned about this ‘invisible’ population, one that has long existed but is just now making its way into the mainstream consciousness. There is a clear lack of societal understanding of gender plurality. I argue that this cultural unintelligibility – especially in the linguistic sense – is one of the main reasons gender minorities experience distress. It is therefore one of my research goals to contribute to the public awareness of gender diversity. The ongoing analysis for my research has revealed a great deal about non-binary people’s unique language patterns while providing a deeper context of their daily challenges. For instance, my interviews have revealed that using a distinct type of language not only serves as a tool for non-binary people to differentiate their gender, but also as a marker of social identity and group membership – one that allows their gender identity to be recognised and more widely validated. Additionally, my interviews have brought to light the discrimination and misgendering that non-binary people face, affecting among other things their overall wellbeing, access to health care, employment opportunities, and education. I am incredibly grateful for the Gradconsult’s microgrant (£440), which has helped me cover some of the costs of my research. Since I am self-funding my PhD living expenses, these funds have been tremendously helpful. I have interviewed 22 non-binary people living in the UK, so I used this money to pay for my participants’ time and contribution to my work. I am also very thankful for the fact that Grandconsult is committed to aiding researchers who, like myself, come from minority backgrounds and are doing research on often ignored or ‘invisible’ populations/subjects. While visiting the Gradconsult office, I felt welcomed and appreciated for my work. The other recipients – all women – also discussed their important research ideas and outputs, which mostly pertained to similarly marginalised or ‘invisible’ populations such as mothers in prison, farming, human trafficking, to name a few. I strongly recommend early career researchers to applying for a microgrant at Gradconsult, given their commitment to assisting researchers who might otherwise not have access to financial support at the early stages of their career.